The report “Starch Derivatives Market by Type (Maltodextrin, Cyclodextrin, Glucose Syrup, Spray Dried Starch, Hydrolysates), Application (F & B, Feed, Paper, Cosmetics, Pharmaceutical), Function (Emulsifying, Binding, Stabilizing, Thickening) & Region - Global Trends & Forecast to 2020” defines and segments the starch derivatives market on the basis of function, application, type, and region, with analyses and projections of the market size of each of these segments in terms of value (USD Million). It also identifies the driving and restraining factors for the starch derivatives market with analyses of the trends, opportunities, burning issues, and winning imperatives. Browse 77 market data tables and 55 figures spread through 163 pages and in-depth TOC on “Starch Derivatives Market by Type (Maltodextrin, Cyclodextrin, Glucose Syrup, Spray Dried Starch, Hydrolysates), Application (F & B, Feed, Paper, Cosmetics, Pharmaceutical), Function (Emulsifying, Binding, Stabilizing, Thickening) & Region - Global Trends & Forecast to 2020"
Starch is a naturally abundant nutrient carbohydrate consisting of a large number of glucose units, mainly obtained from natural sources such as corn, potatoes, wheat, rice, and other plant sources commonly prepared as white amorphous powder. Starch derivatives are prepared by treating starch through different processes such as hydrolysis, extraction, purification, and chemical treatment to be utilized in a wide range of food and non-food applications. Key market players adopted new product development and expansions as their preferred strategies to sustain in the market. 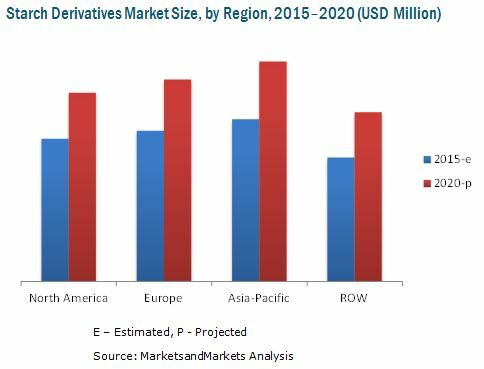 The market for starch derivatives is projected to reach USD 65.42 Billion by 2020 in terms of value. In terms of volume the starch derivatives market was 50.16 million tons in 2015 and is expected to grow at a CAGR of 3.7%. In 2015, Asia-Pacific is estimated to be the largest market for starch derivatives both in terms of value and volume. The Asia-Pacific region is projected to be the fastest-growing market with a CAGR of 6.3% in terms of value during the review period. This growth is driven by the increasing consumer demand for starch derivatives in the pharmaceuticals industry, particularly in developing countries such as India, Japan and China. This report includes a study of marketing and development strategies, along with the product portfolio of leading companies. It includes the profiles of leading companies such as Cargill Inc. (U.S.), Ingredion Inc. (U.S.), Archer Daniels Midland Company (U.S.), Roquette Frères (France), Avebe U.A. (The Netherlands). Other key companies that are active in the market include Beneo GmbH (Germany), Tate & Lyle PLC (U.K.), Agrana Group (Austria), Emsland-Stärke GmbH (Germany), and Grain Processing Corporation (U.S.). The key players in the market are actively launching new products to gain a competitive edge through new product developments.